The Aboriginal symbol means "Meeting Place". Australia is the "Meeting Place" where all Australians can gather in unity under the Southern Cross. With dimensions of the current flag of Australia, and the Southern Cross in the familiar place, the Union Jack is removed. The Commonwealth Star is raised to the centre line and becomes yellow. 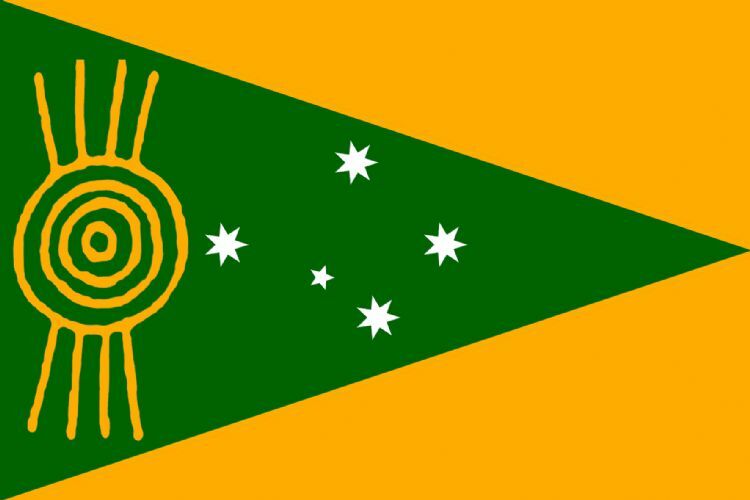 Thus also representing the sun of the Australian Aboriginal flag. 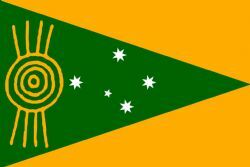 The field is bars of four colours (green, black, red, blue) this incorporates all the colours of the current Australian flag, the Australian Aboriginal flag, and the Torres Strait Islander flag. The multitude of colours represent the diversity and harmony of the peoples and cultures that make this nation what it is today.